Dismissing the petition filed by Senior Advocate Santhi Bhushan seeking regulation of powers of the CJI in constituting benches and allocating cases, the Supreme Court asserted that CJI was the 'Master of the Roster'. Bhushan's petition contended that the concentration of absolute powers in the CJI with regard to the determination of roster was unconstitutional. Therefore, the petition sought a declaration that roster should be decided not by CJI alone, but by a collegium of five senior judges. Asok Pande's case where the CJI-led bench had declared that the 'CJI was an institution in himself', the present bench stated that CJI need not consult the collegium on the allocation of cases. It held that reference to CJI cannot be deemed to mean the collegium. Justice Sikri and Justice Ashok Bhushan wrote separate but concurring judgments. " Although Constitution is silent on the role of CJI as the master of roster, it is based on healthy practise to maintain discipline and decorum of the Court.. CJI has authority to allocate cases and need not consult other judges ", Justice Sikri noted in the judgment. Justice Sikri also stated that acceptance of the plea of the petitioner would lead to practical difficulties, affecting day to day functioning of the Court. Santhi Bhushan had contended that conferring absolute authority on the CJI to allocate cases was unconstitutional, as unbridled and unguided concentration of power in a single authority was against democratic principles. The petition raised the allegation that there were several recent instances where this absolute power was abused with legal malice and cited the examples of listing of CJAR petition seeking investigation in medical college bribery case, petition questioning the appointment of CBI Special Director, petition of Jay Amit Shah against 'The Wire' etc. set aside on the very next day, by a constitution bench headed by CJI. The issue regarding arbitrariness inthe allocation of "sensitive cases" was one of the causes for the press conference held by Justice Chelameswar, Justice Ranjan Gogoi, Justice Madan B Lokur and Justice Kurian Joseph on January 12.
reserved for orders after hearing the “brief arguments” of Pande, who had appeared as party-in-person. On April 11, judgment was delivered dismissing the petition stating that CJI had absolute prerogative in constituting benches and allotting cases. Meanwhile, Shanthi Bhushan had complained to the Registry that his petition, which was filed before the petition of Asok Pande, was not getting listed. extensive arguments, and the bench reserved the matter for orders on April 27. Given the importance of the issue, the bench sought for the views of Attorney General in the matter. The prayer in the petition was for a writ, order or direction holding and declaring that the listing of matters must strictly adhere to the Supreme Court Rules, 2013 and the Handbook on Practice and Procedure and Office Procedure, subject to the clarification that The words ‘Chief Justice of India’ must be deemed to mean a collegium of 5 seniormost judges of the Court. 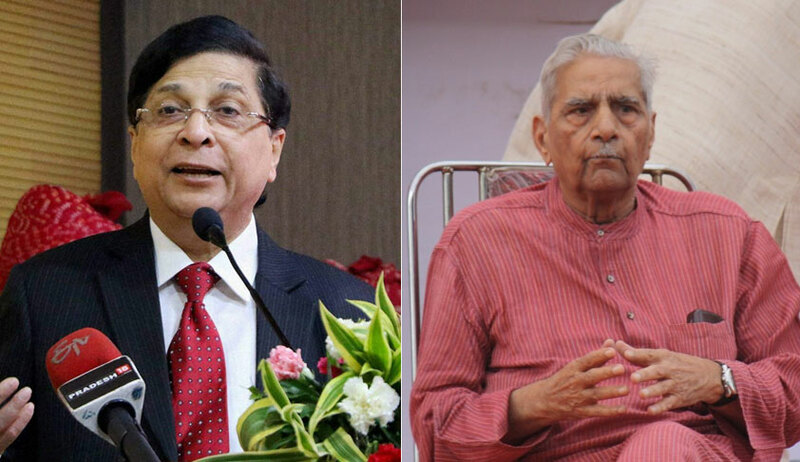 Senior Counsel Dushyant Dave and Kapil Sibal had appeared for the petitioner, accompanied by Advocate Prashant Bhushan, while the court had sought the assistance of AG K. K. Venugopal. In so far as Article 145 lays down that the “Supreme Court may from time to time, with the approval of the President, make rules for regulating generally the practice and procedure of the Court...”, Mr. Dave had suggested, “the ‘Supreme Court’ is not the CJI alone but the full court...”. In the same context, he indicated Article 124 on the establishment and constitution of the Supreme Court. “Please see the contradistinction in Article 130 (empowering the CJI to decide the seat of the apex court) where the Constitution wanted to confer power exclusively on the CJI, it was expressly done...”, he advanced. Continuing in the same thread, he also mentioned Article 146 providing that the Appointments of officers and servants of the Supreme Court shall be made by the Chief Justice of India or such other Judge or officer of the Court as he may direct. Indicating Order 3 Rule 7 of the Supreme Court Rules of 2013, in so far as the Rule stipulates ‘Subject to general or special orders of Chief Justice, the Registrar shall publish such other lists as may be directed; list matters as may be directed and in such order as may be’, Mr. Dave advanced, “there is a limited scope for the CJI to interfere...”. When Justice Sikri remarked that the provision confers power on the CJI, the Senior Counsel advanced, “‘Subject to’ should be read as a Proviso...it cannot overrule the substantive provision...it does not empower the CJI to fix the roster and list before specific benches all the matters...”. Mr. Dave also indicated Rule 8(ii) of Order 3 in the same context. “If roster is decided in January, then atleast till May, matters should be listed in accordance thereto by the computer with no human interference...”, he continued. In so far Chapter XIII on ‘Listing of Cases’ states that “fresh cases are allocated as per subject category through automatic computer allocation, unless coram is given by the Chief Justice or the Filing Counter”, Mr. Dave submitted that it destroys the idea of random allocation by the computer. “Please devise a system to rule out any arbitrariness and cherry picking...the judiciary, and the Supreme Court in particular, is the sole institution that the public vests its faith in...this trust cannot be allowed to be questioned by the exercise of arbitrary discretion...I beseech Your Lordships to take judicial notice of this...”, he prayed. When Justice Bhushan observed that the Handbook is in the character of mere guidelines, Mr. Dave replied that the Supreme Court Registry has singularly followed the Handbook in the particular instances cited in the present petition. Advocate Prashant Bhushan also added on several occasions he has been refused to even be given the Diary number by the Registry without the direction of the CJ on account of the “sensitive” nature of the petition. “The Registry is applying ‘res ipsa loquitur’”, the bench remarked on a humorous note. Where the Chapter states that “No change in the cause list, once published, shall be effected”, he advanced that the contrary “ happens everyday”. “You want the System to be streamlined. Let us not go into particular cases”, states Justice Sikri. “We are not seeking review of these cases but their manner of listing has left a lot to desire...is the power of the master of the roster so sacrosanct that it cannot be examined?...our submission is that these guidelines should not be followed and that the listing and the determination of the roster should be in accordance with the Constitution, the Rules and the system of computer allocation...if at all the guidelines are there, they are being breached singularly by the Registry...”, responded Mr. Dave. “The power of the CJI as the master of the roster is not consistent with the Constitutional interpretation of the ‘Supreme Court’...and where the Supreme Court Rules have given discretionary power to the CJI, the same principle of the Second Judges Case of involving the seniormost judges must apply”, submitted Mr. Bhushan.